This IC pin testclip set provides flexible connection between IC pin to a programmer or testing equipment. 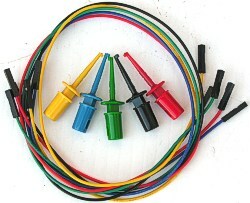 The kit includes five color coded pin clips and 40cm length wires. It also can be used for any programmer, onboard test, data log and measurement etc.